November 16, 2015 (San Diego) – In the wake of recent terror attacks in France and ISIS threats to target coalition force leaders, security is being beefed up across the U.S. One area of potential concern is the dramatic increase in laser beams striking commercial airliners, helicopters, private jets and other air traffic. On November 11th, just two days before the Paris massacres, 20 aircraft were hit by laser beams during flights in the U.S., Reuters reported. Such strikes are potentially lethal, as laser beams could blind pilots, or temporarily distract them during critical take-off or landing times. A laser beam, though a pinpoint of light when transmitted, fans out to become a bright bubble of pulsating light when it reaches the cockpit window. 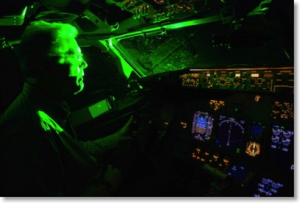 According to the Federal Aviation Administration (FAA), nationwide this year through October 2nd there had been 4,966 incidents of lasers striking planes. That includes 106 incidents right here in San Diego through October 2nd this year, 10 news reports – nearly double the 58 incidents locally in all of 2014 and over triple the 29 cases in 2010 of lasers striking planes here.